In Ancient Egypt and Rome, and even today, Isis was considered to be the perfect representation of motherhood and fertility. Click here to play! She has called upon for protection, bountiful harvests, and general sustenance throughout the years. 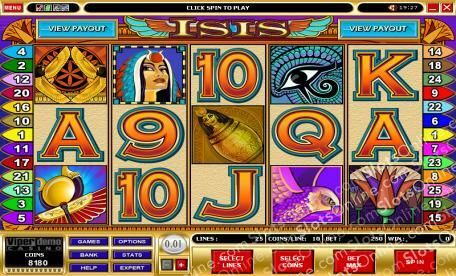 In the Isis slots, you must collect 5 Isis symbols on the same payline to win the jackpot of a lifetime. On the way to this fantastic prize, you will first come across many more Papyrus symbols, Golden Isis Idol symbols, Egyptian Phoenix symbols and many more symbols that will be signs of your being in Isis' good graces. Play the Isis slots today and vie for the affections of a loving Egyptian goddess who may just set you up for life. The Egyptian Phoenix symbol is the scatter symbol in this game, awarding 20 free spins when 3 land on the reels. 4 symbols win 25 free spins, and 5 symbols award 30 free spins. All free spins are at a 6 times prize multiplier. The Isis symbol is wild and substitutes for any symbol other than the scatter symbol. There is a gamble bonus game that allows players to try for double or nothing with wins on the reels. The player puts up the win amount as their stake and then tries to guess the color of a playing card. A correct guess wins even money on the stake, and an incorrect guess loses the stake. On a win, the player may choose to collect or play again.